Clarets boss Sean Dyche accepts his side are enjoying a fine campaign, but isn’t looking any further than the next game. That next game will see Leicester City come to Turf Moor on Saturday, looking to close a six-point gap to Burnley in seventh place. Seventh looks like it will be enough for Europa League qualification, providing Southampton don’t win the FA Cup. 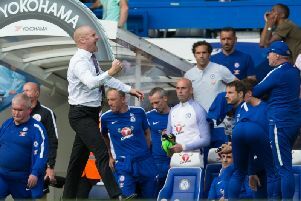 Dyche, however, isn’t getting carried away after a fourth-successive win - the first time the club have achieved that at the top level in 50 years. Asked if he had to accept Burnley are in a good position, as regards qualifying for Europe, Dyche said: “I’ve never not accepted it (the position), I’ve always accepted it. We are having a good season. “The first marker is can you be better than last season? We achieved that a few weeks ago. “Then, let’s take the next one on, we did, then the next one, and now this one. Burnley sit on 49 points, mathematically guaranteed Premier League football for a third-straight season, and he smiled: “That’s alright, I can say it! The most pleasing thing overall is to hit the 40 mark when we did. “It’s not set in stone, but if you get around that mark, usually it strongly suggests you’re going to be in the Premier League. “Then its how far can you go? “I’ve been pleased it’s the mentality after that, because we were soft in the first half at West Ham. I reminded the players of the position they’ve got themselves in, and reminded them to take the challenge on. “And there were good signs today. Even when we went 1-0 down, there was no ‘oh well’, it was ‘come on then, let’s stay in the game and see what we can get’. That mentality is in place regardless of the potential prize on offer: “I’d like to think it’s not just because of that, I think we’ve been building a mentality season on season. “We’ve got a group, not just 11, of players and staff who will work diligently and tirelessly to deliver performances that will get results. “I’m really pleased with that, it’s not just whatever is in front of you, you’ve got to do the work constantly, and we made a point of just focusing on the next challenge, the next game. “It’s my job to look at the bigger picture, but equally to remain focused with the players on the next challenge. Burnley fans have long been singing “We’re all going on a European tour”, which may have carried a hint of irony earlier in the season. Not now: “It started as a joke, and now they’re thinking ‘hello’, might not be such a joke. “I just think we’ve got another game next weekend. I’ve been taking about the next game ever since I’ve been at the club, and it’s true. It was my mentality as a player, you haven’t done anything until the end of the season. “It’s your job to write about the ups and downs and ins and outs of a season, it’s my job to remember you only get measured at the end of the season, when the table is sitting there right in front of you. Burnley won at Vicarage Road despite not being close to their best, but Dyche was pleased with the determination and focus: “It was needed (strong jaw), I think there was a strong mentality, good with all the basics, doing all the ugly, nitty-gritty things we do well, because they had spells of being the better side. “You also need a scratch of luck, but over the season I’m not going to cry that in too much because I don’t think we’ve always had that. “So, good for different reasons, especially with a couple of changes, people have adapted and gone in and delivers performances. “But it’s hard to question the performance, I’m trying to give an honest view, and we were very good at a West Brom, very good second half at West Ham, very good against Everton - it’s hard to keep that level constantly. He added: “We’ve never spoken as if we’re going to just roll teams over every week, we’re trying to build and improve all the time and we have to find different ways of winning. “We did with two set piece scenarios and not many other chances. “We had a golden chance first half, and Woody’s is given off-side, which I think it just is, and other than that, a couple of maybes, good situations but not necessarily chances. “But we took the two chances, a great finish from Vokesy - he could slash at that and its a nice, soft, clever finish. “And then the second is well-worked, Longy’s header is fantastic, and Corky heads it in. “We didn’t look at set plays particularly, we felt we could affect their back four, we know they’ve conceded a lot of goals over the season, but we try and give good information to the players about all aspects of the opposition. “Johann hopefully if he gets a good week’s training, he should be in and around it. But club captain Tom Heaton was back on the bench after over six months out: “It was a tough decision again, Anders has been fantastic, Legs has been pushing all the way, but Tom, over a longer period, a top goalie, and a top servant, so that has to be recognised. “I am pretty loyal at times, equally, it’s not rocket science. Popey has performed well again, and Tom will be respectful of that, because he knows that’s the way it works.